If you own a machine shop or work with similar tools, chances are you probably already have your devices coated with some protective layer. However, as technology progresses, it’s only natural for new discoveries to take what was once state-of-the-art and render it obsolete. This is true for machine coatings as well -- and perhaps no substance demonstrates that better than Aluminum Chromium Nitride. Don’t let the name fool you. True, when most people think of a hard, durable, resilient coating for their machine tools, they automatically think of titanium-based solutions. And why not? Titanium is known for its durability and its ability to protect tools to extend their service life. Over the years, titanium-based solutions have taken those benefits and been able to stretch them even further. In fact, titanium and titanium-based coatings have been the industry standard for just about forever. However, titanium is not the only metal on which a coating can be based. Another metal worth checking out is chromium, as well as the chromium-based coatings that have been developed in recent years. Without a doubt, one of the most useful of these coatings is Aluminum Chromium Nitride, or AlCrN (known as “alcrona” to some). As the name suggests, Aluminum Chromium Nitride is a chromium-based coating that was developed in the early part of the 2000’s. Since then, it has been found to be an excellent choice for coating machining tools based on its superior performance in just about every category that matters. This is due in part to the way the chromium atoms interact with the aluminum in the substance, forming a tough layer that gets even stronger as you add more chromium to the mix. The result is a light, silver-grey substance that contains some remarkable properties. What are the Properties of AlCrN? Just like other coating materials, AlCrN does an excellent job of providing a thin but sturdy layer of protection for your hard-working machine tools. As mentioned above, AlCrN matches or outperforms other coatings in just about every specification category you can imagine. For example, Alcrona exhibits a microhardness of 3200 (HV 0,05) that helps to protect your tools from general wear and tear, extending their service life well beyond what you might expect with most coatings, titanium-based or otherwise. This increased hardness provides your tools with an extended lifespan that can save you time and money, as well as give you peace of mind. In addition, AlCrN has shown a remarkable resistance to heat, maintaining hardness and performing at temperatures up to 1100 degrees Celsius. This is above and beyond just about any other coating you can find available today. This increased heat resistance allows your tools to work longer and hotter without worrying about potential breakdowns, again contributing to an extended service life for your devices. This is all possible due to a coating that is incredibly thin -- at just about 2 or 3 micrometers (which is less than 1/16th the thickness of a human hair) -- and yet harder than just about every other option available. This allows the AlCrN coating to adhere firmly to your tools without compromising their integrity, balance or functionality. A low coefficient of friction (0.35) means that less energy is wasted, less heat is generated and there is less overall wear and tear on your tools. The result is a coating that lets your AlCrN coated tools perform at extremely high temperatures. Alcrona provides excellent wear resistance, which means less stress in general on your machines and less worry overall for you and your crew. The material stays hard and resists chipping, flaking or breaking no matter what temperature or stress it is put under, and this has made AlCrN coatings into an excellent all-around solution that is useful for just about every application you can think of. 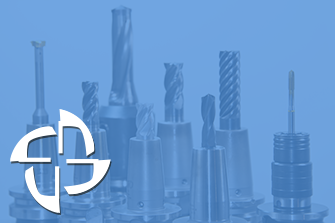 SInce 1982, T.J. Grinding has been manufacturing, sharpening coating a wide variety of tools that can meet all specifications and applications. If you would like to know more about Aluminum Chromium Nitride coatings, the AlCrN coating process, other benefits of AlCrN coated tools or any of our other coating solutions, then please don’t hesitate to contact us today. We look forward to serving you and your needs!